What does “235/55 R 18 100 W PremiumContact 6 MO” mean? The information on the sidewall of a tire may look incomprehensible at first sight but in fact it’s easy to read. With a little practice, you can easily identify the tire width, wall height and rim size and you can work out the speed rating as well. Where things get a bit more difficult is when we come to the load capacity and the manufacturer’s specifications which are more and more frequently on display. 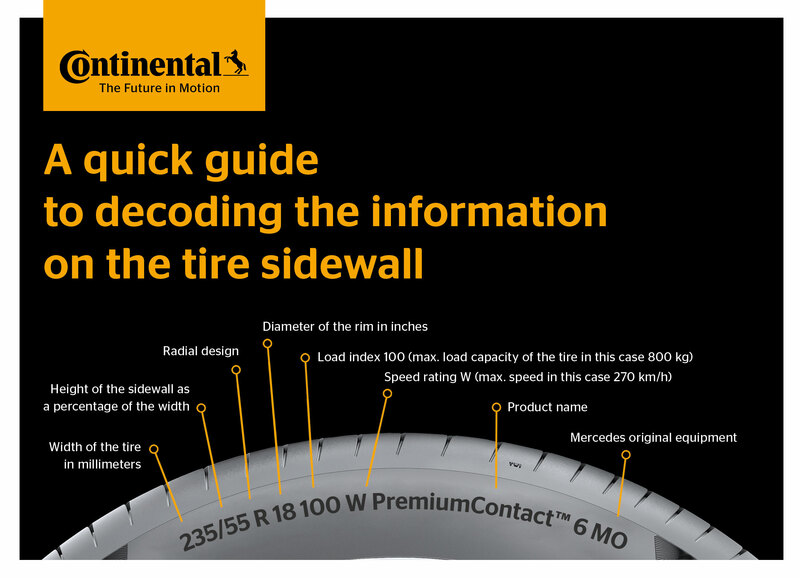 In what follows, tire manufacturer Continental provides some examples of how to decode the “tire hieroglyphics”. If it says “235/55 R 18 100 W PremiumContact 6 MO” on the side of the tire, what we have here is actually a combination of a measurement in millimeters, a ratio, information in inches, a code number, a speed rating, the product name and an OE equipment code. So “235” means that the tire has a nominal width of 235 millimeters. The following “55” is the tire wall height as a percentage of the width. So in our example, the actual height in millimeters would be just under 130 mm. Then comes the letter “R” as the identifier for radial tires. These have been the design of choice for some 40 years, while cross ply tires are these days found only on two-wheelers and vintage cars and in heavy-duty/industrial use. The “18” that follows stands for the rim diameter in inches. The load capacity is identified using a numerical code “100” which in this case signifies 800 kg. With the “W” we come to the speed rating – “W” stands for 270 km/h. Other codes are “H” for 210 km/h, “V” for 240 km/h or “Y” for 300 km/h. The “PremiumContact 6” tire model is a current summer car tire from Continental. “MO” identifies tires with special specifications for Mercedes vehicles. Other identifiers include a star (*) for BMW tires, “AO” for Audi and “J” for Jaguar. As the expectations of vehicle manufacturers and drivers regarding their tires are steadily growing, so too is the number of “tailor-made” tires. As a leading partner to car manufacturers, Continental currently has more than 650 tires with OE equipment identifiers in its range for European automakers alone.